WPF standalone applications execute with unrestricted permissions (CAS FullTrust permission set), whether deployed using Windows Installer (.msi), DOS XCopy, or ClickOnce. WPF browser-hosted applications are hosted by Windows Internet Explorer, and can be either XAML browser applications (XBAPs) or loose Extensible Application Markup Language (XAML) (see Windows Presentation Foundation Browser-Hosted Applications Overview). WPF browser-hosted applications execute within a partial trust security sandbox, by default, which is limited to the default CAS Internet permission set. This effectively isolates WPF browser-hosted applications from the client machine in the same way that you would expect typical web applications to be isolated. Partial trust security is described in more detail in Windows Presentation Foundation Partial Trust Security. 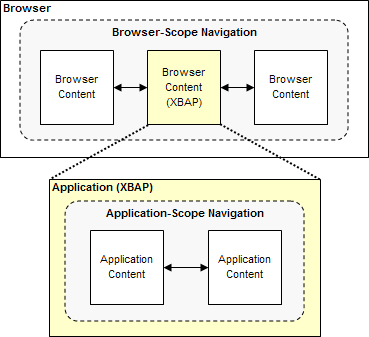 For XBAPs, WPF distinguishes two types of navigation scopes: application and browser. The type of content that is considered safe for an XBAP to navigate to is primarily determined by whether an application or browser navigation occurs. For more information on application data files and pack URIs, see Windows Presentation Foundation Application Data Files. User Navigation. The user caused the navigation by clicking a Hyperlink element. Programmatic Navigation. The application caused the navigation without involving the user. Protocol. The protocol being used to is either http:, https:, file:, or mailto:. If an XBAP attempts to navigate to content in a manner that does not comply with these conditions, a SecurityException is raised. Whether a piece of functionality can run, and how it runs, is determined by a security setting. You can configure the security setting to either enable a disable a piece of functionality entirely, or to prompt the user to decide each time a piece of functionality attempts to run. From the Tools menu, click Options | Security. Select the zone to configure the security settings for. This opens the Security Settings dialog box to configure the security settings for the selected zone. Loose XAML. Controls whether Internet Explorer 7 can navigate to and loose XAML files. (Enable, Disable, and Prompt options). XAML browser applications. Controls whether Internet Explorer 7 can navigate to and run XBAPs. (Enable, Disable, and Prompt options). XPS documents. Controls whether Internet Explorer 7 can navigate to and load XML Paper Specification (XPS) documents. (Enable, Disable, and Prompt options). Enable .NET Framework setup. 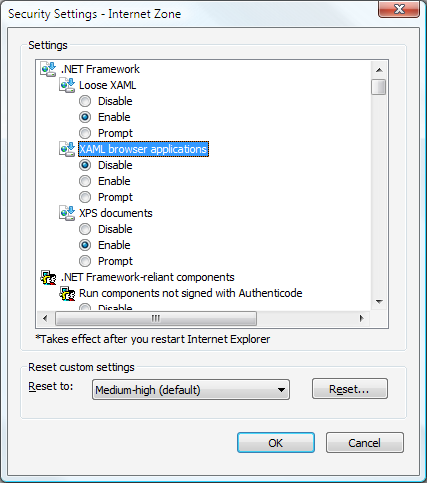 Controls whether the .NET Framework 3.0 can be installed via Internet Explorer 7. (Enable or Disable options only). By default, these settings are all enabled for the Internet, Local intranet, and Trusted sites zones, and disabled for the Untrusted sites zone. 1 to disallow; 0 to allow. Of these settings, XBAPDisallow and WebBrowserDisallow work for all versions of Internet Explorer. However, it is possible for an APTCA assembly to exhibit a security flaw after being installed into the GAC. Once a security flaw is discovered, assembly publishers can produce a patch to fix the problem on existing installations, and two protect against installations that may occur after the problem is discovered. One option for the patch is to uninstall the assembly, although that may break other fully trusted client applications that use the assembly. WPF provides a mechanism by which an APTCA assembly can be disabled for partially trusted WPF applications, including XBAPs, without uninstalling the APTCA assembly. Publishers of an assembly that needs to be disabled for partially trusted client applications in this way can write a patch to create Registry key and value entries for the assembly. Core .NET Framework 3.0 assemblies are not affected by the disabling them in this way, since they are required for managed applications to run. Support for disabling APTCA assemblies is primarily targeted to third party and non-.NET Framework 3.0. Loose XAML files are markup-only .xaml files that cannot be identified by a pack URI (see Pack URIs in Windows Presentation Foundation). This means that they are not resource, content, or site of origin files (see Windows Presentation Foundation Application Data Files). When loose XAML files are navigated to directly from Internet Explorer, they are security sandboxed by the default Internet zone permission set. With this setting, external content will be loaded into a process that is separate from the process that is hosting the application. This process is restricted to the default Internet zone permission set, effectively isolating it from the hosting application and the client machine. Managed code: see Patterns and Practices Security Guidance for Applications. ClickOnce: see ClickOnce Deployment Overview. WPF: see Windows Presentation Foundation Partial Trust Security.